Garmin Pilot is a powerful piece of software that interacts well with other Garmin products. It’s not quite perfect – but it’s not far off. 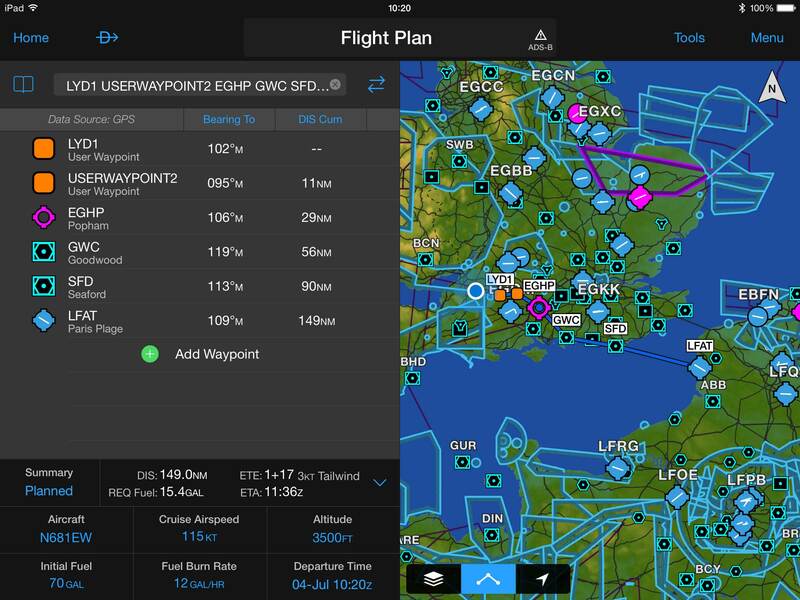 Flightplanning with the Garmin Pilot iPad app. 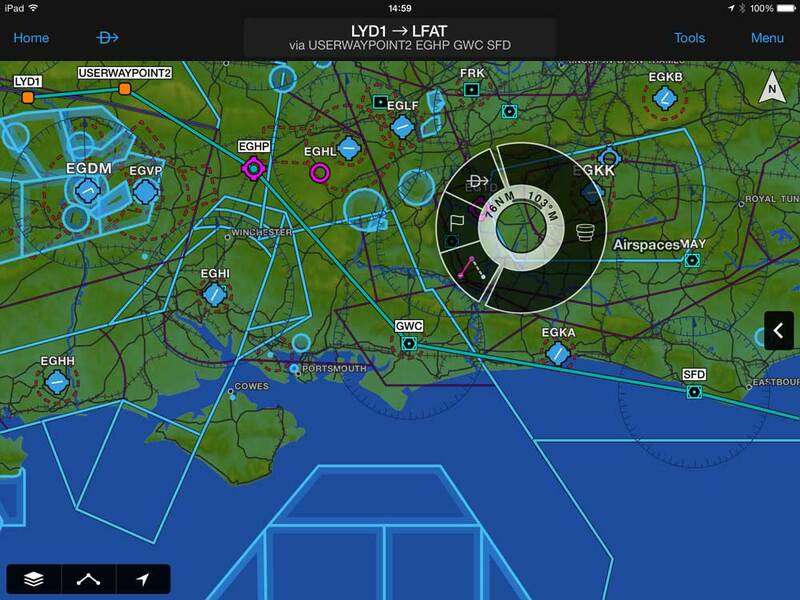 Over the last week we’ve been asking UK pilots about the software they use on their iPads and tablets for flight-planning and navigation. It’s not even nearly a scientific result, but so far the numbers suggest that SkyDemon has the biggest market share, with Airbox’s Runway HD taking the runner-up slot. After that, a number of other companies’ offerings are splitting the small number of remaining pilots. 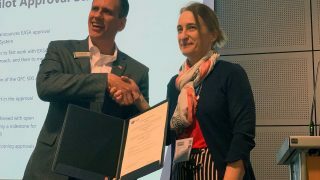 It’s a tough market, but it is one the big companies see as essential, which is why Jeppesen launched its offering in Europe last year, and why it’s about to be followed by avionics giant Garmin. For the last week or so we’ve been running a Beta version of Garmin’s iPad flight-planning and navigation app. If all goes to plan, it should be available for download in European app stores by the time you read this. 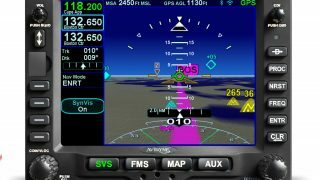 Easy to use interface for Garmin Pilot app. 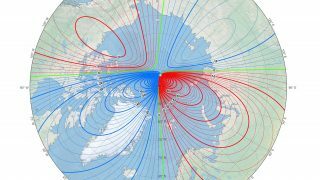 Although the app is sold as a tool for flight-planning and navigation, it’s actually a bit more than that. 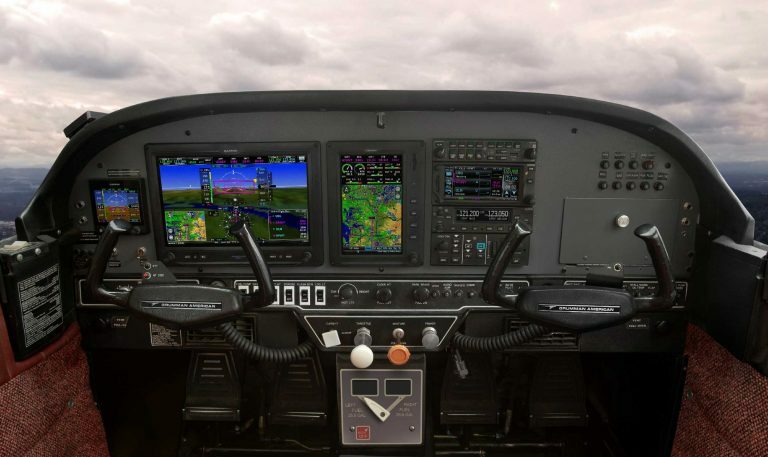 It’s possible to split the functionality into four different areas: flight-planning and preparation; in-flight navigation; pseudo glass cockpit with synthetic vision and attitude information (when paired with the GDL-39 3D); and finally, a control centre and remote screen for Garmin’s excellent VIRB camera. The £139.99 Global Premium subscription includes worldwide airspace, which is displayed on Garmin’s base vector map. We’re fans of vector mapping, but if you prefer a georeferenced, digital version of your paper chart, then these can be purchased from DFS within the app, although there are some anomalies such as the UK is not currently available and only about a quarter of France is covered. Before generating a route, it is useful to create an aircraft profile, which will provide climb, cruise and descent speeds. Routes can be generated either by entering a series of waypoints or by graphically editing the map by rubber-banding your track. This works for VFR and IFR (both charts are included); should you be entering an IFR route, it is possible to do it via the ‘Load Airways’ function that will be familiar to users of newer Garmin hardware. Using the app for navigation is a case of supplying your iPad with a GPS source (if you have the non-3G model) and simply taking off. At any time it is possible to use the ‘Direct To’ button or to drop back into the flight plan page to activate a specific leg. You can set up Garmin Pilot to give a very good primary flight display. 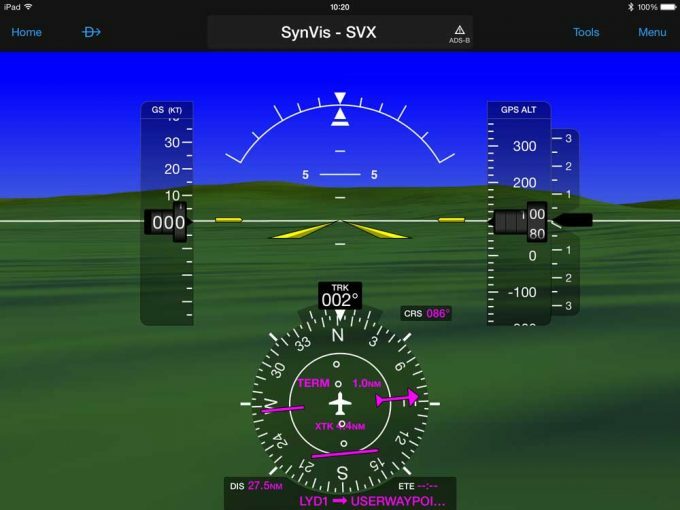 Tapping the home button gives you the option to bring up the pseudo glass cockpit (pseudo because the speed tape shows GPS-derived ground speed rather than airspeed and the altitude is also GPS-derived). In this page you have the option of switching on synthetic vision (assuming you have downloaded the terrain data) and swapping between night and day mode. 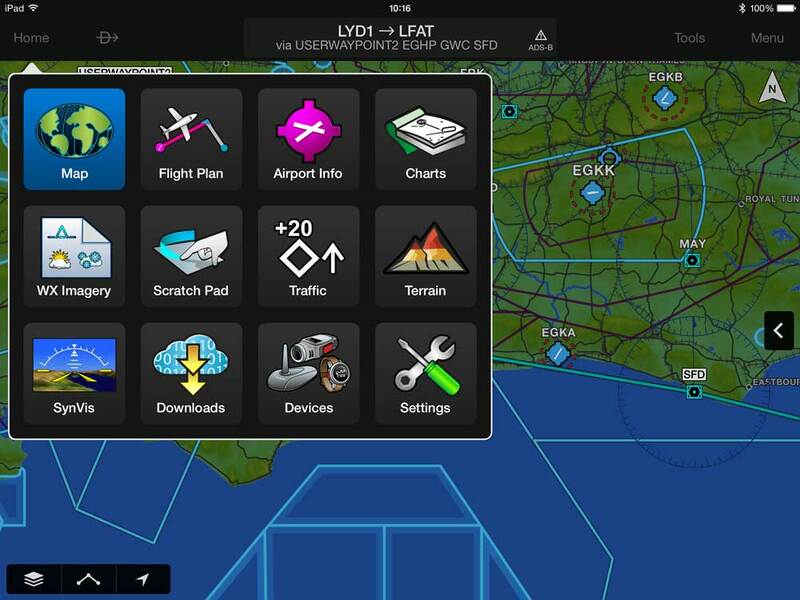 Just like a G500 or G1000, there’s an HSI-like instrument that carries all of the essential navigation data – the only thing missing is, of course, airspace data, which is only displayed on the map page. Finally, one of the strong points is the app’s ability to link to and control other Garmin devices. Should you happen to own Garmin’s D2 pilot watch you can create a route on your iPad and then send it to the watch via Bluetooth. I’m not exactly sure why you’d then want to navigate with a small watch rather than a nice big colour iPad, but I guess it provides an additional screen to glance at for data or a useful backup. 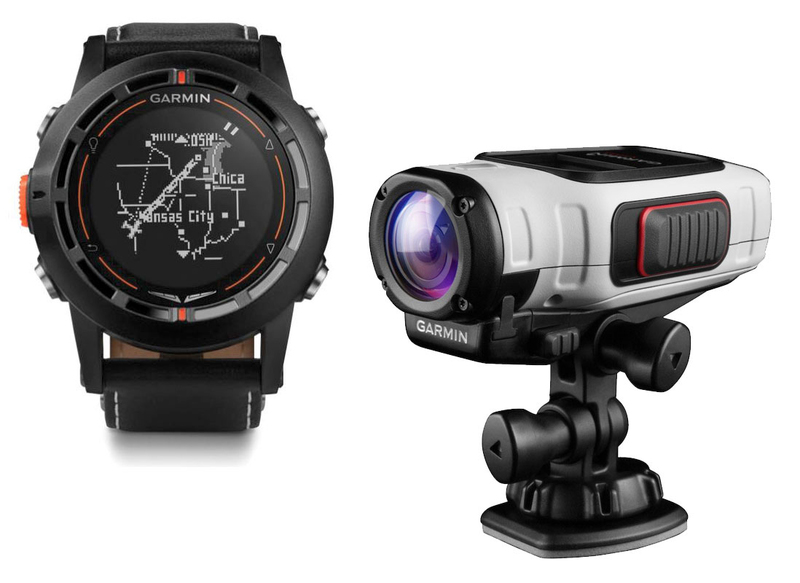 The app will link to the Garmin D2 watch and also the Garmin VIRB camera. If you have one of Garmin’s excellent VIRB cameras, it will create a Wi-Fi zone that can be joined by your iPad. You are then able to change the camera’s settings from the iPad or to use the iPad as a real-time viewfinder in order to frame your shots. Equally, the camera can be turned on and off from the app. When it works, it’s brilliant, although on more than a few occasions the camera has locked up, requiring the battery to be removed for a reboot (the app remains unaffected). There are of course lots of things Garmin Pilot will do: flight-planning, in-flight navigation and pseudo EFIS with SynVis all work well, while the ability to control a VIRB or send a route to Garmin’s D2 watch is a useful bonus if you have either. For now, at time of release [July 2014], it still falls a little short of a complete package with a couple of essentials missing in action. 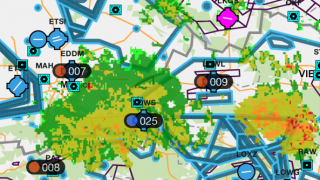 At the top of that list is Graphical NOTAM, which is kind of addictive. Once you’ve used software that puts the relevant notam on the right part of the map, you have no desire to go back and start plotting Lat/Long. Equally, for those overseas trips, flight-plan filing and, better still, GAR filing make life much easier. Does not connect with Garmin D2 Bravo! For some crazy reason this has been dropped for the newer watch.